Our guest is co-author of the impactful book Becoming a Leader of Character: 6 Habits That Make Or Break a Leader at Work and at Home. In addition, he has spearheaded a 5-class program that is designed to teach leaders to become great leaders of character. And including the many resources he has shared in the public sphere, Dave is a former West Point graduate, a veteran, and has a father who was a general in the U.S. Army. In this talk specifically, he shares his 6 habits of character and walks you through the importance of every habit, from courage, humility, and integrity, to selflessness, duty, and positivity. Dave talks about the necessary tools that leaders need, making sure to stress that good character should be the first item on the itinerary. You can’t cultivate the necessary habits for good leadership without first focusing on your own character. Michael C.: What's up listeners, thank you for tuning in to another episode of manufacturing leadership, I'm your host Michael Clements and today we have a show you do not want to miss. 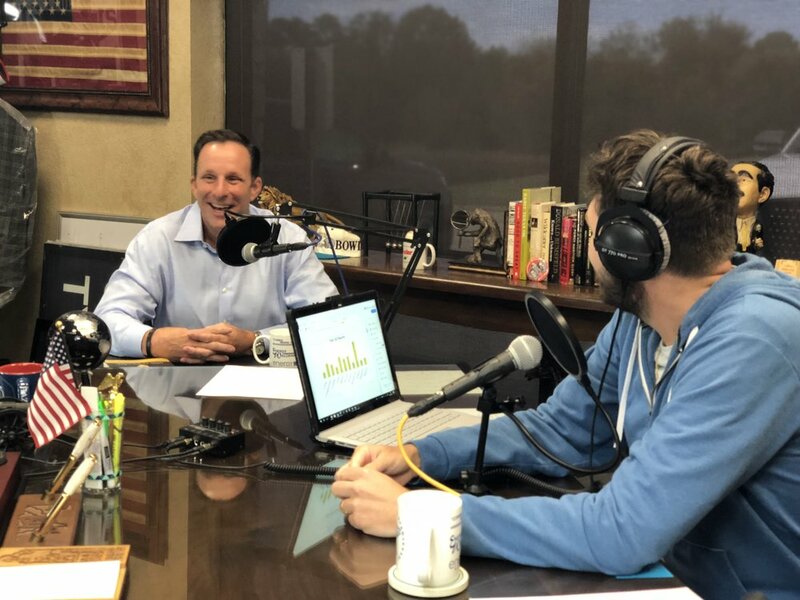 Our guest is a decorated combat veteran, with 20 years of experience at a fortune 50 company in 15 years in sales leadership positions, he is also an in-demand trainer and speaker and co-author of ''Becoming a Leader of Character'' which he co-wrote with his dad. Let's welcome to the show Dave Anderson. Dave Anderson: Thanks Michael, I'm glad to be here. Michael C.: Yes sir, well we're happy to have you here Dave. So just a little bit of background on myself and Dave, we currently are working through a class here at Energy Weldfab, Dave's doing some leadership training with us that we're enjoying very much. Dave, you’re having a good time with us? Dave Anderson: Like I was just saying I feel like I'm one of the guys now, it's been a great group to work with, I guess about every two weeks now we get together and it's been a great time every single time. Michael C.: Yes sir, that's right and plan on in the show we'll get into a little bit more about his class and how that's going for us, but let's just get kicked off Dave, you want to give us a little bit of your backstory. Dave Anderson: Yes, well my background is I'm the son of an army general, my father went to West Point and I went to West Point. Now the difference is he did 41 years active duty in the military, and I did 4, so I was on the opposite end of the spectrum from him but he served forty-one years, his last 24 years he was there at West Point as the head of the physical education department at West Point. And for me I did four years, I got out after serving in the first Gulf War and Desert Storm, and then I spent 20 years in corporate America 15 of those years in different sales leadership positions, but 20 years all at the same company. And in the early part of my career there I married Elizabeth and we have Jake and Samantha who right now our 21 year old twins and their senior year of college I'm proud of them, and now since 2012 I've been running Anderson leadership solutions and been absolutely having a ball doing what I get to do every day, I can't believe that this is my job. I actually am blessed enough to make some money doing it, so it's been great. Michael C.: Man and that's so cool, and you can hear the enthusiasm in Dave's voice and that's something he brings every time that we meet. Dave why did you want to bring this enthusiasm to others, why did you want to get into leadership training? Dave Anderson: It's interesting, I evaluate a lot of different things when I was thinking about leaving a pretty comfortable corporate job successful and things, and I looked at it I loved developing people, I love seeing people grow and then the whole idea of leadership a lot of people ask me well Dave why don't you do sales training and I do some sales training. I mean honestly it used to be something I even had on my website but I've taken it off, my website most time companies I've done leadership work with them and then they asked me to come in and help with their sales teams. But when you think about being a sales trainer, if I help somebody become a better sales person that's like helping somebody become a better accountant or a better engineer or something, those skills stay at work when somebody heads home at night. But when I help somebody become a better leader, especially what we talked about a leader of character that follows somebody home, that makes them a better mother, a better father, a better husband, a better wife, better in their kids schools, better in their ministries, better in their communities I mean if I'm going to impact this world for my kids and your kids and future generations it's going to be with leadership, because I believe leadership is really in a crisis State right now in our culture and working with leaders in all different industries. Nonprofit, for-profit, working with the Salvation Army and Dell I mean two very different organizations, I do a lot of work with law enforcement and in all those areas this idea of becoming a leader of character it gets me fired up. You can tell I mean whenever you've sat with me in interview classes now you see I get fired up when I talk about this stuff, because I've been called a character evangelist and evangelist lead revivals, I'm trying to lead a movement around character and I'm just trying to find other leaders to join me. Michael C.: Well it makes so much sense and especially in a world today where everybody feels like they got to take action, well we're all capable of taking action but when we take that action is it the right motives, do we have the right goals in mind, do we even know why we're taking action. And what I've been learning through this course is it's our character and our habits that make that character, that impact those decisions whenever we make those actions and so if we want to make better we have to be someone of character. Dave Anderson: Yes, and what we always talk about is leadership being a blend of competence and character, and the competencies very simply are what we go to school to learn and it's the competencies around on-the-job training and training and the continuing education a lot of people get in their work, those are all competencies and I just sum that up as knowing what to do and how to do it. Now the other side of the coin is character, character is the foundation of every good leader, I mean let's look at the other side of the coin when somebody fails as a leader, they rarely fail because they don't know what to do or how to do it, they fail because something in their character when they're tested at the moment of testing their character fails them and they make a bad choice. We spend all our time focusing on training competencies, and that's kind of where I've come in, my father and I wrote the book becoming a leader of character and my mom was the only one who bought a copy of the book it was worth getting to do it with my dad, because I'm very blessed to have a father I look up to the way I do and I know not everybody has that, but I do. But now I get to carry that baton for him and I take this whole idea of character and it is been just going like gangbusters, and like I said I have a ball talking about this stuff because this is the stuff that matters. Michael C.: Well it's enjoyable hearing how you're relating these things to character to your real-life experiences, and then also having a dad that was in the military and a military general, and also coming up in that environment and then also being a student at West Point, these are all things that a lot of us don't get to experience in life. So getting to hear that experience and then how competencies and character mix for leadership you've said this is taking off and it's going really well, what do you think excites you the most about whenever you walk in a room for the first time and you're about to start teaching in a class, what is it that gets you excited? Dave Anderson: I think now at this point where I've been doing it six years, I'm focused on these areas and it's what I truly believe I'm going to hear at the end, which is I get so many people come to me and say Dave nobody's talking about this stuff, nobody talks the way you do about leadership and it's true. I spent 20 years in the corporate world and I had a lot of great trainers come in, my company spent millions of dollars each year training people and I was blessed to have all those opportunities as you mentioned. But when you get down to it most leadership training is in fact management training, and that's what I felt like in a lot of those courses that I went through in the corporate world and even when I got my MBA, which was they were telling me this is what you do to other people to get them to do the stuff that you want them to do. It wasn't about who I was as a leader, and I was fortunate to have my dad and I was fortunate to go to West Point, but there was a time in my life I lost my way, where I was focused on metrics and only on metrics and hitting numbers and all that type of stuff, and you heard me tell the story about the year we ended up last in the entire country. We ranked in sales and our team ended up last, 72 out of 72 in the entire country, all I was doing that year was pushing buttons and pulling levers on people, trying to get more out of them. And then I was driving down the road one day, I was listening to a book on tape, so all the people out there who can't see my face now you know how old I am because I was listening to a book on tape. But I was listening to a book on tape and a guy named Earl Nightingale said the fastest way to change a team is to change the leader, and my first reaction was oh crud they're going to fire me, because I'm last why wouldn't you fire the last-place guy and then I thought about it and I said or the leader can change. And that was a seminal moment in my life where I realized I needed instead of focusing on what everybody else needed to do better, I was the only common denominator on that team, I was the leader of that team, I was responsible for them yet I'm focused on everybody else I wasn't focused on myself, and the whole idea of character and the importance of that and who I wasn't being based on my choices really changed a lot of things for me at that moment. And fortunately, I got a team that rebounded despite their leader, and we did end up being number one later on and really built a great reputation as a team that I was working with up there, I was very blessed to have the right people in the right place. Michael C.: One of the most positive things I've taken out of the class and this was something that I notice right away, is that this wasn't like difficult management training in the fact that exactly like what you just said, it's more focused on how we're getting to those decisions, how we're making that decision before we take that action, what is behind that and through doing it that way what we've seen and what we've discussed with our team here at energy, is we're making better decisions at our house. We're making better decisions with our co-workers, we're making better decisions with our friends, we're becoming better listeners, better communicators and it's so much better than what I've seen in previous management training that I've done is that this is not about manipulation techniques. So if I step on somebody's foot they're going to say oh or they're going to punch me, okay there's going to be an outcome there but that is not management, like you said and I think a lot of leadership training that I've seen is all about manipulation and techniques to get a rise or to get someone motivated or whatever it may be. But when you come at it with the approach of character mixed with competence, we start to see a different formula and a different makeup. And Dave I guess this is a good opportunity; you want to move this into your six habits, the pillars of character? Dave Anderson: Yes, well we talk about six habits of character, because character is a habit. We start with the idea that your characters are sum total your habits your good habits and your bad habits, and we all have both, nobody, no one person who's ever walked this earth had perfect character, the rest of us we don't and we all got any room to grow. But it's a sum total of our habits and our character is like a muscle you got to exercise it to get it strong, and it's consistent exercise, nobody would ever expect to get in shape by reading a fitness magazine, and just because I hope you read our book becoming a leader character but that isn’t going to do it for you. You've got to exercise these muscles and when we exercise character it's going to make us uncomfortable, just like when we go to the gym we know we got to break a sweat and be uncomfortable. So these are habits of character and we exercise them consistently and they become habits, and these habits are courage, humility, integrity, selflessness, duty and positivity or attitudes and they're all habits that we can develop over time, we're born with our personalities but we develop our character. Michael C.: Born with our personalities and we develop our character, so that means that we do have an opportunity that maybe if we've made some bad decisions or earlier in life maybe we did something that we didn't feel like what a leader would do, we don't have to live in that forever correct? Dave Anderson: Absolutely, that's why I told that story about being dead last in the country and realizing I needed to change, oh my gosh there's so many things I've had to change in my lives. Life when I look back and decisions and choices I've made that there were regrettable choices, and I regret a lot of the choices and we all have them, there's nobody out there that doesn't have choices they don't regret. But the thing is we're not stuck in those choices that are the good thing about this idea that our characters, our habit are our sum total habit because we form habits one choice at a time, each time we make a choice it makes it easier to make that same choice again and again and again. So if I've been in the habit of making a certain choice and it's not a positive one let's say, and I've been in the habit of making a certain choice like say fibbing or little white lies by the way you already know I don't believe in those they're all lies period and a story, there's no level to lying it's all lying. But if we're in the habit of doing that, okay well that doesn't mean we're stuck there, we can start today making a new choice and exercising integrity. And like a like a good friend of mine Colonel Craig Flowers who talks a lot about character and sports, and I do work with him and he's a great man, and he calls these things character reps just like at the gym when you do a rep at the gym, you're exercising each time you do this in the small decisions and the big decisions as well. Michael C.: And so a character rep and one thing that you kind of describe this as in our class was, if you're trying to get up and go work out and you consistently, let's say you want to get up at 6 so you can work out at 6:30, you have to be at work at 8:00 and you consistently wake up at 7:00 every morning and you realize well I don't have time to work out. So you wake up earlier at 6:00 a.m. and you go work out, but you've mentioned it it's not easy to keep that going, but after you do it day one and then you do it day two and you do it day three, it becomes more of a habit. Can you use that analogy and maybe elaborate a little bit on that? Dave Anderson: Yes, well I'm mean it's something that we all have experienced, by the way I love an attentive student, thank you for listening. Let me tell you it's something that we've all done, we've started those workout programs and we've felt real good about them as we've gone through, and we're going hey you also need your seeing your clothes fit a little bit better and you getting all excited, and then I always joke about then there's that morning. It's raining outside and it's cold and damp and that comforter feels so good, you're like oh man if I could just get 30 more minutes of sleep I'd be golden, I've got a meeting today, I've got this, I got that and you kind of reach over and slowly and you just kind of hit that snooze button and that's not a morally wrong choice, it's neutral it's a morally neutral choice but we all know what that was, that was the beginning the end of that workout program we had started. Because each time we make a choice it makes it easier to make that same choice again, getting up early it became easier each time we did it but the first time we choose not to get up, the next time that alarm goes off it's real easy to make that same choice to stay in bed under that comforter again. So yes I joke about that but that's a habit we're all familiar with, and just by making a single choice we can start down a new path in a positive way or a negative way, I think that's key to understand. Michael C.: Out of the six habits a character the courage, humility, integrity, duty, selflessness, positivity out of which one of those is there any of them that are more important than others? Dave Anderson: Yes I call them foundational as opposed importance, but the foundational to our courage and humility. Now if you'd asked me before I really started thinking about this and spending time, I've read a lot of books on leadership, and I know you have too and I appreciate that about you, but I read a lot of books on leadership and like I said I've gone to a lot of courses. And you hear everybody say oh a leader needs to have integrity, a leader needs to have integrity and I 100 percent agree and I might have made the first chapter on integrity. But then I started thinking about it, you can't have integrity unless you have courage, because it's the only time you do the right thing is when it can't hurt you personally, that's not integrity. The word integrity the root word is integer which is that old math term which is a whole number and integer means whole or pure, that means part time integrity is not integrity. So if we're only choosing to exercise integrity when there's no personal cost to it, that's not integrity. And so I started looking at courage as the foundational one, but then the other one came up which is humility, because if we go back to those regrettable choices that we've all made and we dig deep we start recognizing the fact that the root cause of all those is fear and pride. Fear and pride are the root cause of most of our decisions that we regret in our lives, and so the antidote to fear pride are courage and humility and courage and humility are the foundation to our character and they're the foundation to the other four habits of character. They all tie in together just like when you do a push-up, to continue that exercise analogy, when you do a push up, push up works the chest and works the shoulders and it works the triceps, but they all work together, so it's meant to work the chest but those other muscles work together. So if I'm exercising courage I'm also likely exercising other parts of my character as well and vice versa. Michael C.: Yes, I don't want to give out the whole class here but one of the things that you had mentioned for this was when someone has something stuck in their teeth, and you see it stuck in their teeth and you'd mention that in our minds we don't want to say anything to them because we don't want to embarrass that person, but well I'll let you explain that. Dave Anderson: Well it's interesting Michael because every class, every group I don't care if I'm sitting there with ten people ten, twelve people like we have with your group or I'm sitting in front of a thousand people, I ask them that question why don't we tell people when they got something stuck in their teeth, and somebody is going to say well I don't want to embarrass them and I nod my head usually and I say yes that's what we say to ourselves. But in actuality it's not because we don't want to embarrass them, it's because it would make us feel uncomfortable to say something at that moment. And that means we're putting our own comfort in front of the needs of somebody else, people are like what's the big deal Dave, it's a big deal because it's a character rep, we're exercising those muscles daily in the small things. See too many people think that well like go back that white lie, this little white lie is no big deal but when the big test comes I'm going to be ready and to that I always say well if you never lifted 50 pounds, what makes you think you can lift 300? We've got to exercise in the small daily stuff so we're prepared for the big test that comes. So yes something in their teeth it's a funny story, it gets a laugh and everybody's familiar with that because we've all gone back to the car and looked in the mirror and seen that big green thing in our teeth, and we're like we had just been with our quote/unquote friend who didn't say anything to us and we're wondering why they didn't, but it wasn't because they didn't want to embarrass me, it's because they were going to feel uncomfortable. That's a rep of courage, doing that little character rep exercising courage and a very small choice, but it's going to prepare us for the bigger choices to come. Dave Anderson: I can't believe you just said that, that's exactly what I do. Michael C.: So I kick the little piece of ice under there thinking it's not a big deal, but then after this class I started thinking there's one of my character reps, what if I'm not afraid to push a little piece of ice underneath the counter, what are the bigger decisions in my life right now am I not afraid to push underneath the counter. So it really started hitting home with me and I started saying, hey if you don't want to push other things underneath the counter, you got to stop pushing this little piece of ice under there even though it's going to melt and it's going to go away, that's still not the proper place for it. Michael C.: Oh my gosh, now I'm convicted on that, I mean I'm always finding things I'm convicted on because again these are all quote-unquote small things but they're window into who we are. There was just an article in The Wall Street Journal here and my wife read it to me where somebody was talking about they saw an elderly couple on a weekend, pull into a parking lot in a business building that was totally closed, nobody was in the business building, this person has no idea why this elderly couple pulled in. But they pulled in, there's no cars in the parking lot whatsoever, and they pull in and the man parks and they get out and their wife walks around the car and she points out and the writer is observing this from over in another parking lot, and she points out to him that he's parked on the line, there's no other cars in the parking lot they're parked on the line. And he looks at her says you're right and he gets back in the car, starts the car up, pulls back out and makes sure he's not taking up more than his spot, and the point of the writer in the Wall Street Journal was that's character in action when nobody's watching in the small things, you know that these people care about doing the right thing in everything that they do. And it's such a convicting thing and now you just convicted me about the cubes of ice on the ground, I do that Michael golly I can't believe you just said that. Michael C.: The neatest thing about doing some of these leadership training, especially with some other fine leaders in the classroom is you start to hear some of these little bitty things that maybe we do or some things that maybe we can improve on. And so what we find out is that none of us are perfect, even the best of leaders and like you mentioned there was only one perfect one, there was only one person and he had outstanding character. So whenever it came time for him to make a decision, speaking of Jesus right now, when it came time for him to make a decision his character was already in place, his DNA, everything was made up to make that, ours unfortunately we know right from wrong but understanding how to make those decisions like you said at the point that you absolutely need it, you got to be making the right decisions and good habits leading up to that moment. Dave Anderson: Right, and that's why I call them habits it's not perfection because we're never going to reach perfection, there's only one perfect man he's not here right now, he's coming back I believe that but the thing is we're not called to be sinless, we're called to sin less. And so we continue to make choices and try to ingrain these habits deeper and deeper into who we are, our character, but we're still going to screw up, we're still going to make a bad choice here and there hopefully it's just as small as kicking the ice cubes under the cabinet. But the thing is we always have another opportunity, another opportunity to make a choice to strengthen our character again, and those opportunities come daily and I want to make sure everybody understands that. That everything that we talked about in our classes are a hundred percent in our control, we've got things that we complain about all the time in life, we complain about traffic, we complain about politics, we can complain about the economy, we complain about our bosses, we complain about this, we complain about our kids, we complain about our spouse, we complain about all these things we can't control, but we have our character which is a hundred percent in our control. And our character is the number one reason why people are going to follow us, because people don't follow us because of what we can do, our competencies, they follow us because of who we are, our character. Michael C.: I think this is a good moment for our listeners too to take a moment and just think in your life and in what you do, where do you think you're kicking that little piece of ice underneath the counter, we all have those things, we all have those so what in our lives can we be improving on and it's not a matter of making a life decision and saying, well I'm going to do this every single day the rest of the year. I think it's more about just the next time it happens pick the piece of ice up, and then the time after that. So take some time and focus on those things for yourself, I think that's really how we develop as leaders is when we take those moments of conviction or what we've heard from someone else and we say okay where can I find that and how can I apply that to what I'm doing. And in our minds we can justify anything to ourselves, so it's important that even if we may be justified something to our self as being a good decision, to reassess that maybe ask others or do a self-analysis. Dave Anderson: Yes, as a matter of fact we even put together, when we published the book we put together a character assessment that anybody listening to this they can go and just go to www.mycharactertest.com again that's www.mycharactertest.com and look it's a five-minute character assessment. And I just want anybody out there listening this is free, it doesn't cost you anything, it's private none of your information is going to show up in any sort of psychology magazine or some study that I'm going to publish somewhere, don't worry it's private it's just the whole idea, it's holding a mirror up to ourselves and say where's my character today. And so maybe I can identify something in those six habits where I need to work on, and if you put your email address into the system then you'll get the results emailed to you as well when you do that, but again it's www.mycharactertest.com that you can take that assessment and figure that out. Michael C.: And this is something we got to do in our first class with Dave, all of our team did this and it's really neat to do these assessments because you hear a lot of oohs and ahhs and oh I figured something else out about myself today. So this is really a good tool and thanks for sharing that with our listeners too Dave, then Mycharactertest.com think that's got a wonderful tool and it's something easy, it's short, it's quick and can tell you a little bit more about yourself. Michael C.: You can do these assessments; I think this is a good tool for all of our listeners out there. And one thing you can take away from this is you can identify some areas in your life where maybe you can find improvement, and this is something you can reach out to other leaders even Dave himself, you can reach out to and ask questions about these and say hey, this is where I showed up, this is where my character shows it is, what can I do to work on this? And a lot of times even if we just see it our self, it really can help. But something we were able to do as a team was disc profiles and this is something a lot of leaders are familiar with, this is something that after working through this and doing it, I would highly recommend I think this is a wide range of people use these disc profiles, so it's not a fly-by-night thing. This is something that a lot of organizations use, I've heard of a lot of organizations doing this for their entire workforce. So Dave let's talk a little bit about the disc profiles and where that really helps with communication amongst a team. Dave Anderson: Well yes, because we all have different personalities I say all the time, you're born with your personalities you develop your character. And so our personality I always think of its kind of like an instinct, what's our first instinct in a situation and disc it's a system that's been around for a long time. Remember the first time I did disc was I think 1995, it was the first time I did disc but there's a lot of difference personality systems and there's going to be different people who sell different personality systems and they all work, and they all describe us accurately. I just choose disc because I find it the easiest one to relate to people and to teach, but the whole idea behind it is we define humility in our book, believing and acting like it's not about me and the problem in most communication situations is people make communication about them. We're so focused on hearing our own words and not listening to other peoples, that it's a very selfish, we're very selfish in our communication. Whereas effective communication is really about the other person, I'm just trying to talk or I'm trying to have impact on the person across from me especially as leaders. Our goal is not just to talk, it's to have impact, I mean we've all been there where we have that Seagull leadership, we have that leader who flies into our meetings, dumps on us and flies out, that's seagull leadership, they're just wanting to talk but am I truly trying to have impact. And to have impact on people we need to be able to adapt our communication style to that other person's personality, and first thing we got to do is understand these personality types, understand who we and then understand how to identify other personalities types and adjust in order to have that impact otherwise we're just sets seagull leader just talking away and dumping on people and not having the impact. Michael C.: Once we're able to learn about the personalities and the traits and the things that go along with each one of those, which disc is an acronym D.I.S.C and your personality will fall under one of those letters. And so we have a dominant trait and then we have a secondary trait correct? Dave Anderson: Most people yes. Michael C.: Most people, so it was really neat to hear about that, but it was also really cool to see the rest of our team and where they fell, what was really interesting though is that Dave didn't, I guess it was kind of like pulling this sheet off the present, he waited until we were about two and a half hours into our training to finally tell everybody to get out their profiles and everybody started sharing which personality trait they fell under. And once that moment came in the room before that there was everybody making these assumptions as to which who would be what and this and that, and the whole room was shocked after we were done with this and they were all saying wow I didn't see that coming. But then once we learned about the personality traits it was hey, actually I do see this and man the feedbacks been wonderful, is that what you see whenever you do these disc profiles is that a common thing? Dave Anderson: It's one of the most fun classes people, I mean we have a lot of fun in class, I joke around a lot, but I think to see people recognize not just themselves but also start recognizing why they have problems with certain personality types. Certain people drive us crazy naturally, there's certain personality styles that have natural conflict just because of the way they approach every situation by their instincts, and when they start recognizing that fact they start laughing because they realize oh I've always had this trouble with cousin Ernie and cousin Ernie's always driving me crazy, now I know why cousin Ernie drives me. Or sometimes this is a person in the room and they're looking at each other with the light bulbs going on, and it is a lot of fun to see that and see people really develop an understanding and then the process is I called the whole class communicating with character because I sat in a lot of these classes as I said before, and I sat there and I watched a lot of leaders I respected, very capable people sit in those classes as well and then I realized down the road they didn't implement any of that stuff that they learned. So just because you hand somebody a tool doesn't make them a carpenter, they have to use the tool and so that's where the character part comes in. I start with the whole character aspect of everything, before I get into some tool like disk because it's really is a reflection on who we are whether or not we're willing to use these type of good management tools, and I think that's where some training falls down is because we go right into the tools as opposed to focusing on who the leader is. Michael C.: So really through the class you built the foundation up for where we were going before we did the disk, you wanted us to understand the leadership aspect of it but the competencies and how they mixed with character before you dumped on us, hey this is how you're going to analyze your personality and others, we really had to have that core of character before you can just start going around saying I think I know what this person is or what they're about. Dave Anderson: Well the old saying is definition of insanity is doing the same thing over and over again and expecting different results, if you look at engagement surveys and all those things that people use, engagement surveys haven't approved through the last 15-20 years since those engagement surveys have come out, why not it's because we're still training people in the exact same way we've always trained them, and I always feel like it's like we're giving cough medicine to a pneumonia patient. We're treating a symptom which is poor communication of people not communicating well or communicating well with personality styles different from them, but the real disease is character people not being willing to adapt and change, that's a character issue. Most of that training that we provide people are symptom relief as opposed to treating the real problem which is character and that's why I start with character, because as I start identifying these things in those early classes and those early sessions, I don't care whether the leader is a frontline leader in oil and gas industry or I'm talking about CEOs, CFOs of banks and things, I see light bulbs come on and people are realizing it's one of the most flattering moments is at the end of the class when we're talking about courage, humility, integrity, selflessness, duty or positivity when people come up to me and say have you been watching my life because there's certainly some ouch moments, I call them ouch moments where people go ouch because I bring something up that reflects their character. I don't know them, not yet usually those are the first sessions, but it doesn't matter even when I'm doing keynote addresses in front of thousands of people and when I bring these things up somebody comes up to me at the end of it and say I felt like you were speaking to me or this just happened to me last week or whatever, and it's because character is the root cause of most of our issues in life, yet we don't address them, we're giving cough medicine to a pneumonia patient and that doesn't make any sense. Michael C.: Our culture here at Energy Weldfab is one that we want teamwork, we want good communication but at the end of the day there is no magic wand that you can wave no matter how bad a leader wants these things or how bad even the organization as a whole wants someone to strives for them, there has to be avenues to get there, there has to be tools that you can use. One thing that we've seen from this class is that this is given a lot of our leaders here in the company a toolkit that they can then take back out into the organization, and they work with each other as leaders but they're also working with their folks in all these other departments. And we do have a good mixture, we have some individuals in here who are not managers that are in this class, but we believe are going to be leaders in this organization. So it's really exciting to see, to some of these folks it's new theories this is all new they haven't heard some of this stuff, so getting to see their eyes light up, but really getting to hear the conversations whenever I go and ask somebody out in the plant, like hey have you noticed this from the training yes me and so-and-so we're talking about this yesterday and we've noticed that there's been an increase in productivity from so-and-so just because of how we've handled some conversations with them. Or really just the communication being humble, staying positive and one of the biggest ones to me out of the habits of character is the selflessness, that is something that for myself has to be a focus. I'm an only child so I grew up, it was me and I had wonderful parents that just spoiled me beyond belief, and so a lot of this you have to learn where are your weaknesses in this and how do you improve on them. So selflessness is one that me and my only child wife both have to focus on, and together whenever I also am I married to somebody that has to focus on being selfless, it becomes something that we can work on together, but even through this this gives us ways that we can improve. So I don't think we ever run out of tools out there, I guess I don't want to say there's so many tools out there but it's always good for us to be pursuing something that we believe can make us a better person and from taking this course I really believe that, not only are we producing better leaders here at Energy Weldfab or a better environment or a better culture or we're going to try to promote that through this, but we are trying to make us a better team, a team of character and whether we're in the workplace or we're out of the workplace we are who we're going to be and we're going to make good decisions. And if we can build that type of community within our organization, that's the type of community that is going to go out in the community and do good for those around us and in our area. Dave Anderson: Right, well it's like I said in the beginning if I help somebody at work in these areas they take these things home. And one of the things that you touched on there Michael, training a lot of people have choices of whether or not they do training or don't do training with their people. And I love that old quote by Zig Ziegler, I think he's the one who said somebody asked him one time, hey what if we train all our people and spend all this money and they leave, and his reply was what if we don't train them and they stay, but you think about this and the most expensive training out there is a training that doesn't have any impact. And how do we keep this stuff alive, how do we keep these things going and so much of it relies on people like you and the leadership here at Energy Weldfab, what are you all going to do after this training is over to keep it going and to keep these conversations alive, because if something's important it's worth repeating. And just because we've said something once doesn't mean it's going to have impact, so we've got to keep this stuff alive and one of the things that we've done is here at the end of October, we just published our four-week action guides now, so we have these six books that have four weeks of reading and each reading is only a page long and there's some questions after each one of these readings, and the whole idea is to provide individuals and organizations four weeks of reading on each of the six habits of characters. So we got courage, humility, integrity, selflessness, duty and positivity that's six months of follow up, that now every organization or every individual who goes through the training or reads the book or does whatever, we continue to marinate people's minds and this stuff. And I talk about it's like a marinade, we keep marinating their minds so it sinks in that's what a marinade does, it sinks into the meat when barbecue sauce just sits on top and burns off under the fire, the marinade sinks into the meat so when the fire comes it actually flavors the meat and it protects the meat and that's what we're trying to do here is make sure we have long-term impact on the leadership within the organization, whatever level that leader is at. And so how do you continue to make sure that this stuff sticks is what I'm always concerned about, because I went to too many great leadership events that two weeks later if I asked anybody what they learned they couldn't repeat back to me anything that they learned, and we're trying to remedy that with our approach. Michael C.: I hear what you're putting out right now and that's whenever we're done with this leadership training after next week, the ball is now in our court and the leaders that have been in that class to keep pushing the progress that we've made in these five weeks, and to see hey okay we're done with the training but what is next, and it can't just be the trainings over we'll meet in a year and see we'll there's some more training in a year. What you're saying is you got to keep this thing going, so you need a set up maybe a regular meeting or something to be sure that this is still carrying an impact? Dave Anderson: As a matter of fact, our next session with Energy Weldfab is on exactly that issue, and so there's a method to my madness how I walk through these things, because we meet every two weeks and we start with individual character focused on who we are as leaders and then we move into these one-on-one interactions when we're talking about communication and coaching, and then we move into now how do we affect the organizational character. As opposed to culture we talk about organizational character, because the character of an organization is its demonstrated values not the values up on the website or on the wall because every company has really nice sounding. Michael C.: Mission and values. Dave Anderson: Yes exactly, they all have really nice sounding stuff but how do people actually behave, and not just with the customers but with each other as well, that's the true culture of the organization. So I've taken it from culture because too many people think that's whether or not you have beanbags in the break room and what type of k-cups are available, that's not culture those are Perks. Culture is really how people behave and how they demonstrated values, and so how does a leader shape those things and what's great about what you've done is you've brought the leadership team in and the top levels in, and the companies I've seen the most success with as far as really having this stuff permeate the organization is they start at the top, and then they start working their way down through and at least they get down through their middle managers to continue, so everybody has the same language going through it. And then after that it's those middle managers responsibility to filter it down all the way to the frontline people, and they take it from there and there's a company called the Genesis group who's in telecommunications multi-million dollar company, they've put about 70-80 percent of their entire workforce through our program now and we've got a case study that if anybody wants to see that case study, I wrote it up with the president of the company together and you can email me at Info@ALSlead.com info@ALSlead.calm and I can send you that case study but it's an amazing indication the impact a character has on those measurable like productivity and efficiency and the lack of turnover, they've seen an incredible drop in turnover in their organization because of the character of the leadership and then the character of the organization changing. Michael C.: In the very first class, you mentioned how and this is going to the turnover, is we will have somebody that does a good job and they're doing a great job and you really don't want to fire that individual, but it the first time they have a character issue we let them go, and you mentioned we got to be training on character not just what's going to be productive in the workplace. Dave Anderson: Yes, I mean we hire for competency, we look at resumes and say oh look you've done this, you've done this wow she's done a job like this for seven years she'll be a great fit right and then we'll sit there and we'll bring him on and we'll train them, we'll train them on all the ways our company does business, we'll have HR come in and train them on our procedures and manuals and everything and then we'll do refresher training with them and all those type of things. And we continuously hire people for competency; we continuously train people on competency and continually fire them for character. I mean again insanity, doing the same thing over and over again and expecting different results. I like a definition of sanity a little bit better when being sane is if you want to accomplish something you never accomplished before, start doing something you've never done before, start focusing on character. Michael C.: Dave it's been a wonderful opportunity getting to meet you and get to know you through these classes and our conversations outside of class and if your organization or even you as an individual, I know Dave also does some one-on-one coaching. So if you as an individual or you and your organization have a need for some leadership training or for a character building, this can be a wonderful, absolutely wonderful class for you. And Dave also offers single classes, so if there's maybe one or two things that some topics you can discuss with David, and he can give you a game plan for how he thinks you can go after that, but as far as our company we're going through the full five class program and we have thoroughly enjoyed it and this is something that we do plan on putting more of our employees and team members through in the future. So Dave I think you've hit at home on something here with the character and developing leaders through character and good habit training, so I think you're doing a wonderful job with this, our team has thoroughly enjoyed it but also the impact I've seen you directly make and the conversations I've heard from them, I know already you said that's something to get you excited but you have a lot of reason to be excited about what you got going on here, but also what's in store for you in the future. Dave Anderson: Thanks Michael, like I said I just consider myself a leader of a movement, a movement that I'm just trying to find other leaders to join me in and if anybody's interested in learning more about some of the things you just mentioned, our programs are we have online courses, we have different free downloadable materials, PDFs and things that you can use posters etc. that focus on these six Habits of character. Just go to Becomingaleaderofcharacter.com is where you can find all that information, Becomingaleaderofcharacter.com. There's also a place where you're going to contact me if anybody wants to have me as a speaker or bring us in to do some training, but its Becomingaleaderofcharacter.com is our website that we're working off of. Michael C.: Dave that's wonderful and you're located out of the Tyler area, correct? Dave Anderson: I'm right here in Tyler Texas, I wasn't born in Texas but I got here as soon as I could. Michael C.: Just a last little thing before you go, who are you going to be rooting for in that Army Navy game? Dave Anderson: Well I don't think there should be any question about that that the army team, the pride and dream of every heart and gray is the team I'm going to be fighting for and rooting for. I was born and raised there, I don't miss a game, I've got my kids well indoctrinated even though they didn't go to the Academy, it's the best game on TV you're ever going to watch and the one thing I will say about the Army Navy game is I seen this posted somewhere before, the Army Navy game is the only game that you'll ever watch where everybody on the field is willing to die for everybody in the stands, and that makes it special. Michael C.: Dave awesome show today, I really appreciate you being here and taking some time out to do this. Dave Anderson: Thanks Michael I appreciate the opportunity. Michael C.: I hope everybody really enjoyed the show today, really enjoyed having Dave on and we really want to bring you some good leaders and some great conversations, so I hope all of our listeners really enjoyed this today. And if you have ideas or if you have comments or suggestions for us, reach out to us Podcast@energyweldfab.com we're also on all of the social media channels Twitter, LinkedIn, Facebook, Instagram @EnergyWeldfab. So, check us out there, check out our pictures, our photos, we got stuff from the podcast there as well as our website EnergyWeldfab.com/podcast you can check out the podcast there. And also, if you have an iPhone or any mobile device wherever you listen to your podcast on, we're on all the major channels there, so if you're familiar with podcast, stitcher radio just to name a couple there, we are available there. So, help others find us though, so hit subscribe, leave a review and tell a friend about our show. We've had a great time and great feedback and really just appreciate our listeners out there. So, I want to thank our listeners and have a wonderful day, Dave thank you again. Dave gives some of his backstory, including his time at West Point and the military. The parallel between the development of character and taking strong action. The most exciting aspects of teaching others about leadership and character. An explanation of Dave’s six habits of character. The intersection between integrity and courage. A breakdown of what a ‘character rep’ is. On daily opportunities to practice the cultivation of our character. On the importance of DiSC profiles. Why working on character first is so essential. Selflessness is a really key skill for leadership. On the action guides that he developed. Why demonstrated values show the true culture of an organization. Information on Dave’s 5 class program. Leadership is a blend of competency and character, as Dave points out. You can’t become a good leader by focusing on others more than you do on yourself. We all make regrettable decisions in our lives, but we aren’t stuck in those actions or bad habits we create. We can and should change our character by addressing our bad habits. It’s a continual effort. Integrity requires a personal cost, as well as courage. There’s no such thing as part-time integrity. In fact, the etymological definition of the word means “pure” or “whole”. Don’t underestimate the small things. Character in action is often best represented by the small, positive things you do when no one’s watching. Take multiple moments to identify the actions, habits, or the ‘ice-kicking’ tendencies in your own life and try to understand them in the context of your character. Most of the time, techniques for making better leaders fall far short because character isn’t addressed first. This means that tools are given to people who haven’t learned the necessary character to apply them yet. To effectively communicate with someone means thinking about the other person more than yourself, and making sure you aren’t just talking but actively communicating as well.